(Nanowerk News) A study undertaken by researchers from the University of Alcalá (UAH) shows that if the “super-polluters”, the high-polluting vehicles, such as certain buses and lorries in a poor condition, were removed, pollution from nanoparticles could be reduced by up to 25% and 48%, depending on the parameter analysed ("A probabilistic source attribution model for nanoparticles in air suspension applied on the main roads of Madrid and Mexico City"). These minute particles cause serious health problems. 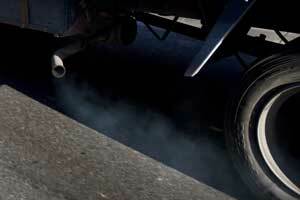 “Usually you can see the ‘super-polluters’ simply just by looking; particularly when they accelerate or climb a hill and a cloud of smoke comes out of the exhaust pipe”, comments the physicist Philip Siegmann, from the Department of Signal Theory and Communications at the University of Alcalá (UAH) and co-author of the study. “People usually complain about the bad smell and the smoke, but the worst thing is that the nanoparticles that nobody can actually see or smell are always present in Madrid, for example, even when you think that you are breathing in clean air” the researcher points out to SINC. The new study confirms that the “super-polluters” are, “by far”, the vehicles that emit the largest amount of nanoparticles. The report concludes that were these vehicles removed from the flow of traffic, the “total active surface” (TAS) concentration of the nanoparticles (the particle surface that interacts with the environment) could be reduced by up to 25%, and the concentration of particulate polycyclic aromatic hydrocarbons (PPAH) absorbed by the nanoparticles, which are known toxic substances, could be reduced by up to 48%. The study, published recently in the review entitled Atmospheric Environment, has focused on distinguishing and quantifying which types of vehicles have a higher emission rate of nano- particles, namely the ultra-fine ones (less than 100 nm in size), that are implicated in the development of different diseases. Their reduced size enables them to be distributed within the body with hardly any detection by the defences of the organism, and can even cross the cell membranes. Some studies have already shown that these small particles stimulate allergic reactions, such as asthma, and the development of multiple sclerosis. Moreover, under continued and prolonged exposure, they can produce cancer, as is the case with tobacco. The researchers have noted that one of the main emission sources of these ultra-fine particles comes from diesel powered vehicles, but this is less so for petrol powered vehicles. “In any case, it is the super-polluters that pollute the most, since these are usually the ones in poor working condition and with poor combustion” Siegmann points out. The expert considers that these vehicles need to be removed from the traffic flow. In order to obtain measurements, the scientists had to follow moving vehicles and, through the window, record the data using two sensors located at the end of a tube. The recordings were taken every ten seconds and were made by sucking in the air so that the sensors could pick up the measurement peaks when they entered the trail of smoke emitted by a vehicle. In the case of the “super-polluters”, the PPAH measurement peaks ranged from 100 to 1,000 nm/m3, but in some cases this even exceeded this high quantity. The study data were taken in Madrid in 2001 and 2006 and in Mexico City in 2001, one of the most polluted cities in the world. Although they do not appear in the report, measurements were also taken in Boston (USA). The highest number of emissions of nanoparticles corresponded to Madrid, and the scientists relate the data to the fact that a high percentage of the cars in this city are diesel (nearly 30% in 1999-2001 and 50% in 2006), whereas in Boston there are fewer emissions of this type because nearly all the vehicles travelling on the roads are petrol driven. Mexico City finds itself in the middle, although there is a plethora of “super-polluters” in this city. Nevertheless, in Madrid, the results confirm that over the last 6 years pollution from nanoparticles has reduced by nearly 65%. The researchers justify this because of the improvements that have been incorporated into new vehicles in order to comply with the European regulations regarding emissions, such as the ‘Euro 4’ level which will be replaced by the ‘Euro 5’ level in 2009. Despite this, Siegmann recognises that ‘super-polluters’ are still on the roads in this city. “Anybody who is waiting at a bus-stop will have suffered from a cloud of smoke emitted by a bus as it accelerates”, he adds, “and in this cloud of smoke large quantities of all types of particles, including nanoparticles, are being emitted“. Nanoparticles mainly come from human activities such as the combustion of coal, incinerators, vehicles, burning of rubbish, kitchens, barbecues and tobacco, but they can also be natural in origin, such as those emitted by volcanoes. In any event, the exposure of the human being to these substances has increased as a consequence of the industrial development throughout the 20th century, particularly with the advent of diesel driven cars, with the consequent health problems.